So glad to read that. Hidden Faces has always fascinated me. It seemed to have an interesting premise but was thrown to the wolves up against ATWT. NBC had lost the rights to Let's Make a Deal which had provided some competition to ATWT for 4 years and ABC picked up LMAD which left NBC in the wilderness. Hidden Faces was created by Irving Vendig, who had created Edge of Night. NBC should have programmed it at 4.00 where, like EON, it could have captured the male and teen audience that enjoyed Edge. Thanks for reading. I forgot it was NBC, not ABC. I should have put NBC. I wish I could see some of the show, especially since the female cast didn't do a lot of other big soap roles. I have a few other articles around here and there, when I can find them. Some more info on Hidden Faces. 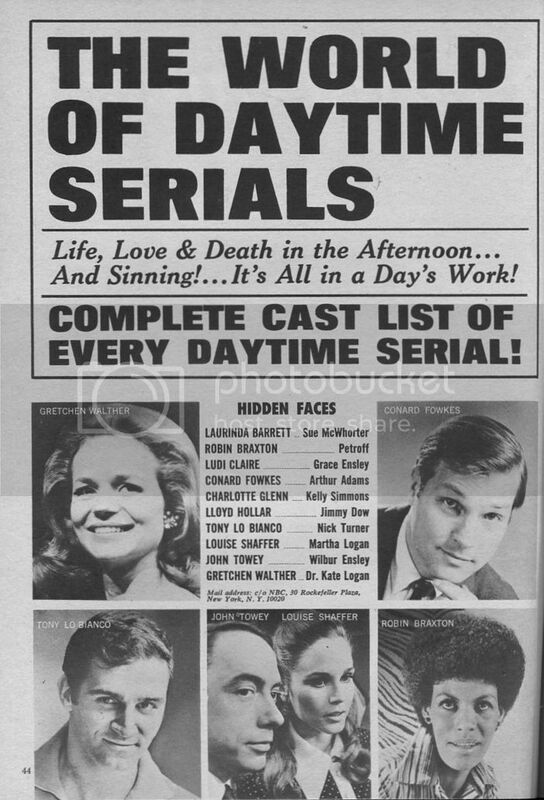 As well as performers listed above the cast included Nat Polen as Earl Harriman, Ludi Claire as Grace Ensleyand a young Linda Blair as Allyn Jaffe. Tony LoBianco was also listed as Nick Capello Turner. I always forget about "Hidden Faces." The story with Louise Shaffer's character and her boyfriend sounds very traditional for a show that seems very out of the box in terms of typical soap opera fare. TV Yearbook circa early 1969. 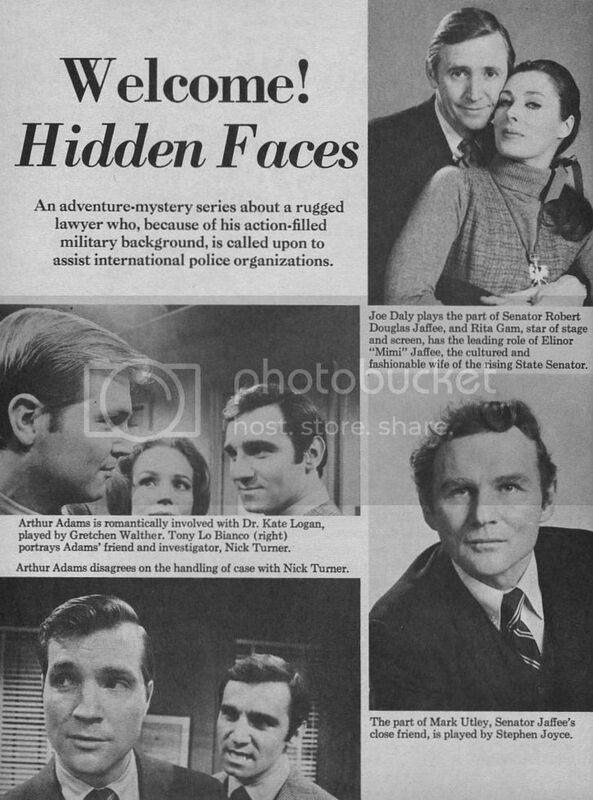 Actor Joseph Daly, who played Senator Robert Douglas Jaffee on Hidden Faces, died on August 8, 2015. If I locate his obituary, I will post it here. "RIP Joseph Daly - one of the best teachers I ever had. You..."
April 7, 1930 - August 8, 2015. Husband, father, actor, teacher. Memorial Services in New Jersey August 15; in NYC August 23 at Producers' Club. Actress Rita Gam, who played Elinor "Mimi" Jaffee, has passed away at the age of 88. Rita Gam also appeared on Love of Life. 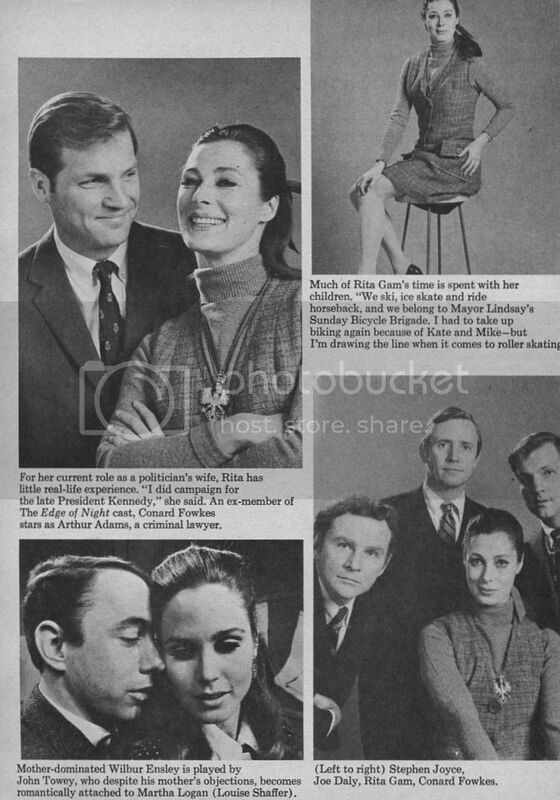 For many years, I have wondered if Irving Vendig had written this show by himself or if he had another writer. I had even asked Louise Shaffer (who had replied that she never looked at the name of the writer that early in her career). Tonight, I have learned that Wayne Greenhaw also wrote the show with Mr. Vendig. and Beyond the Night: A Remembrance the following year. The latter work is a poignant telling of a young boy's near-death experience. In 2000, Greenhaw was appointed to the board of directors of the Alabama Humanities Foundation by Gov. Don Siegelman. In 2006, he co-authored with Donnie Williams The Thunder of Angels, which details the struggle for racial equality in Alabama. His writing was augmented by frequent lectures and seminars. Greenhaw was the recipient of numerous awards and honors, including the Harper Lee Award from the Alabama Writers Conclave and the Hackney Literary Award from Birmingham-Southern College. Greenhaw published several hundred articles in publications ranging from Reader's Digest to Music City News. Residing in both Alabama and Mexico, he produced works in English and Spanish and found common ground in both places in his writing.